What would you remember most after travelling abroad? A cityscape? A landscape? Or beautiful natural views? Actually, how you remember an overseas trip largely depends on how you define it. If you regard travelling abroad as a shopping spree, then all you recall will be brand shops. Likewise, an overseas trip can mean refreshment, self-discovery, or wandering around. The city that I am speaking of is Granada. Located in Andalucia, the southern region of Spain, it may look like a typical Spanish city with plazas (squares), parques (parks), and fuentes (fountains). However, there was something special about this city that shaped the meaning of my trip. So, what was so ‘special’ about this city and what meaning did it give to my journey? The answers lay in the unique characteristics of Granada. Granada has a meeting point of four different cultures: Catholic, Gypsy, Islam, and Jewish. About 1,300 years ago, Granada was built to be the capital of the last Islamic kingdom in the Iberian Peninsula. As gypsies and Jews moved to the city, Granada avoided Catholic influence for a long time. Then, in 1492, Granada was finally conquered by Christian kingdoms, in La Reconquista, which refers to a reconquest movement by Christians. Since then, Granada has transformed itself into a multicultural stronghold. Granada’s cultural diversity can be found almost everywhere around the city. For example, there is the Catedral de Granada (a catholic cathedral), Alhambra (an Islamic palace), San Nicolas (a gypsy plaza), and Albaicin (a Jewish district). Albaicin was the first place that I visited on my first day in Granada. At first, the streets in Albaicin looked like what I usually saw in a Pocari Sweat advertisement - white houses, white walls, and stone roads in a Greek countryside. However, I noticed something different. In the Albaicin district, I could feel that it was not just a beautiful sightseeing place. Behind the white walls, the struggles of Jews, Arabs, and gypsies were hidden everywhere. They have not been the majority of the city’s population, since Granada was rebuilt as a Catholic city about 600 years ago. Restaurants, bars, street vendors, and flea markets alongside narrow alleys continue their struggle to maintain their livelihoods in the district. However, there was also humor in white-covered Albaicin, in harmony with the struggle. Merchants and waiters never stopped smiling as they tried to haggle prices of products they sell or entice tourists. Street stalls were decorated with clothes and fabrics with unique patterns, which made me feel like I was walking along an Arabian street, rather than a Spanish one. 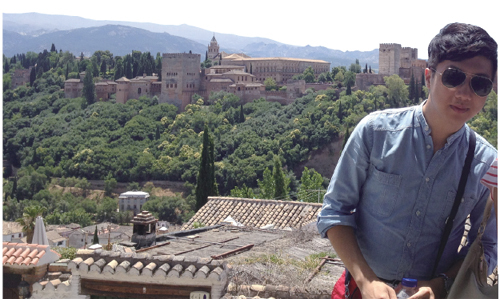 On my second and last day in Granada, I went to Alhambra and San Nicolas. San Nicolas, a small gypsy plaza, could be only visited after walking up numerous stairs. When I was walking up the stairs to visit San Nicolas, the weather was sweltering with the temperature rising up to 41°C. It was really annoying to keep walking in such a hot weather, but the scenery of the neighborhood cooled my mind. I was mesmerized by the wall paintings and the unfolding view of Alhambra, which stands at the opposite end. 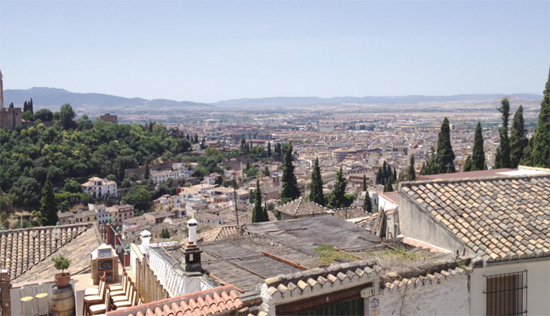 The view of Alhambra and the entire cityscape eventually unveiled themselves when I arrived at San Nicolas. Overlooking the entire city, I could understand why many people in Granada bother to climb up the stairs and take a break in San Nicolas. The breezes and fresh air made me forget about the hot sunshine. Moreover, in San Nicolas, I could understand why travelling is not just about sightseeing. While relaxing in San Nicolas, I realized that reading a book or resting in an exotic place can be also considered travelling. Liberated from the pressure that I should visit and take pictures of famous places, I relieved some stress and refreshed myself for the rest of the trip. In San Nicolas, gypsy musicians played several songs for tourists while I was there. Even though I had never heard of such music, the gypsy songs openly expressed their joys and sorrows that ringed my heart. Alhambra was the last destination of my stay in Granada. Alhambra, which means ‘red’ in Arabic, is a big palace built by the Islamic kingdom. The royal patterns on the structures, along with the fountains and the terraces, were preserved so well that they never looked like remnants of a 14th century building. Walking through the palace, I could sense the strongest Islamic flavor that I had not seen in other parts of the city. Even though I already knew that Granada was a multicultural city, the palace made it clearer that it is not just a city with Muslims starring in trivial parts of its history. Alhambra presents concrete evidence that Granada still breathes in and out under the Islamic influences. In addition, it was my first time seeing such a grand cultural asset while travelling overseas. I did not completely understand what the symbols in the palace stood for, but Alhambra’s greatness in size was enough to impress a 20-year-old, freshman backpacker. Looking back at the time that I spent in Granada, the city helped make a meaning for my journey. After staying in Granada, my trip began to mean ‘understanding the differences.’ It was a unique experience to see a foreign city where different cultures coexist and harmonize. Before arriving in Granada, I did not know what I should focus on during my trip. However, there, I discovered the main point of my trip: how cultures can exist in such harmony and how it affects people. Thanks to Granada, I could concentrate more on ‘cultures’ during the rest of the trip. Granada surely gave a name to my trip and I feel it is worth visiting again to taste its unique coexistence one more time.